In just three weeks school will be starting again in our area. Summer seems great for the kids, but long before school actually starts, the kids get BORED – tired of the “everyday” things that they do, and are as ready for school to start as their parents! The big thing is —- are YOU ready for the kids to start school? If your kids are like my grandchildren – they’ve outgrown the clothes they wore last year and we are BUSY getting clothing made for this year. As you probably already know, I have a set of 7 year old quadruplet grandchildren (and their BIG brother who just turned 9 this past Sunday)! These kids can be difficult to find or make clothes for them! The two boys will wear anything — one of them likes shirts that button down the front and the other one likes pullovers, but does want collars on them (easy peasy!). The girls, on the other hand are the difficult ones! One of the girls wants ONLY pink things – pink stripes, pink printed, pink polka dots – just as long as it is pink, so we shop for as many different pink patterns and shades of pink fabrics as we can find, then get busy sewing. The other granddaughter wants purple – so it’s the same story as with her sister – only it means finding fabrics of all kinds in purple shades and prints. As you have probably guessed, they NEVER share their clothes! 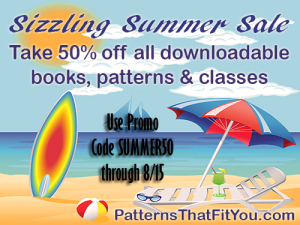 I’m thrilled to let you know that we are having a Sizzling Summer Sale at PatternsThatFitYou, where we’re giving a 50% discount on all downloadable books, patterns and classes, through August 15. Use the promo code SUMMER50 to take advantage of the huge sale prices! 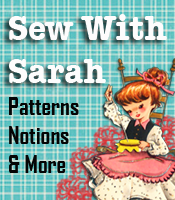 Grab a bunch of the books, patterns and classes now while the sale is on – don’t forget the Holiday Season will be coming up quicker than you think, and with these books and classes you’ll be ready for all your fall sewing, whether you’re sewing for men, women, children or doing the crafty sewing.